The church sanctuary is graced with a stained-glass window, referred to as a Triptych, or Apocalyptic window. The design was done by Rev. Nathan Pope (Pastor Emeritus at First Evangelistic Lutheran Church, Racine, Wisconsin). It was constructed in his studio and installed in 2010-2011. His design is meant to convey a number of Biblical truths about Jesus’ return on Judgement day. 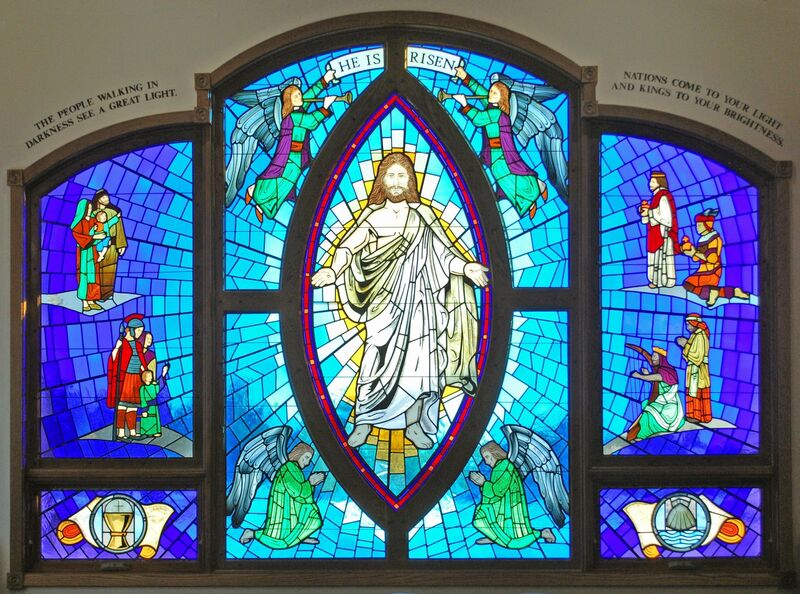 The window was given in loving memory of Dr. Donald E. Wohlrabe in thanksgiving to God by his wife, Fayelyn, and their children. These explanations are derived from Rev. Pope’s writings, and in most cases are his own words, summarized and formatted for this webpage. Centerpiece, Jesus Christ – The Triptych features the Risen Christ in its center, surrounded by the ubiquitous “Mandorla” shape, which has been traditionally used for centuries as shorthand to signal that Jesus is both God and Man. The Risen Jesus is an apocalyptic scene which conveys a number of Biblical truths; apocalypse means “to reveal.” The Risen Jesus has nail marks in his hands and feet, calling attention to his crucifixion. The Four Angels – From Matthew 25:31 “When the Son of Man comes in his glory, and all the angels with him, he will sit on his glorious throne.” Rev. Pope explains that the color of the angel’s robes are green primarily for esthetic purposes, and that angels are often represented in green when depicted in stained-glass. Upper Side Panels – Jesus is surrounded by worshippers, both high and low, Jews and non-Jews. This bears out the truth that the gospel of Christ’s death and resurrection finds a happy home in all sorts of people in both Old and New Testaments. Lower Corners – The lower corners represent the Eucharist or Communion, and the shell and water representing baptism. Crowning Scripture on Wall – Isaiah 9:2 The people walking in darkness have seen a great light and Isaiah 60:3 Nations will come to your light, and kings to the brightness of your dawn.